Can we talk about what it’s really like running around doing “all the things”? You are too busy to think about being happy right now. At this time of year you are completely focused on getting everything done…I wonder…when is the right time to focus on your happiness? Next week, next month, next year? The thought of being in the exact same place 12 months from now has you feeling anxious and overwhelmed. You’re stuck somewhere between procrastination (aka planning) and bold action. You’ve done everything right, been the “good girl” like forever and you still full unfulfilled…dare I say…empty! You believe that hard work is rewarded but you’re having a hard time figuring out when you get to be happy. You want to be challenged, not exhausted by your work, your life. You want to learn to relax and not feel the need to numb out. Right now, you’re trying to figure out how to get everything done with the limited time, energy and money you have. Ignite your passion and leave you with a sense of purpose and direction. Give you a clear picture of what you need to more forward. Offer you an empowering supportive coach in your corner. Would you jump on board? I know you would because I would have done anything to stop feeling like I needed to escape my life simply to survive it. That is why I know the Woman On Fire Spark Sessions are exactly the magic you’ve been looking for. We will come together for four 2 hour Spark Sessions and together we will work with your mind, heart and gut, move through the following steps and achieve our goal of re-writing your story and creating a new year full of possibility. Reflect – Take time to look back on the past 12 months and pick out the highlights of the year. Celebrate – Focus our attention of every thing you did in 2018 that deserves to be celebrated. Trust – Begin to trust the part of you that believes in your greatness. Believe – Believing is seeing, start the visualization process and begin to pull together what you want for the next 12 months. Reconnect – Begin to connect the emotions you desire to your vision. Receive – Open yourself up to the possibility of your greatness. Rewrite – Literally rewrite your experience to better reflect your desired outcome. Decide – Make your vision non-negotiable. I know you are not used to spending money on yourself at this time of year…honey, it’s time to make yourself a priority and do something just for you! 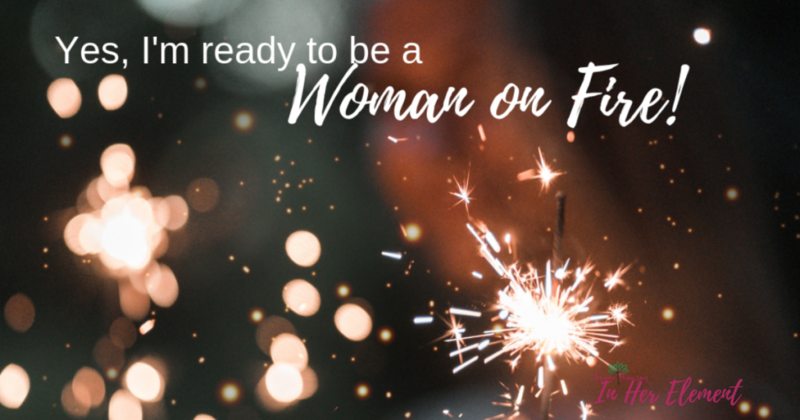 Learn more and register now for the Woman On Fire Spark Sessions and take advantage of the 50% off discount! Wrap it up…put it under the tree…treat yourself this year and get ready to set 2019 on Fire!